MRT boost: While the residential and commercial development would unlock the value of the land, it is the new My Rapid Transit line and its connectivity which would help to add considerable value to the residential and commericial projects in that area. PETALING JAYA: The race is heating up among property players gunning for a piece of the long-awaited redevelopment of the 1,215 ha Rubber Research Institute (RRI) land in Sungai Buloh, industry sources said. While some property players have presented their ideas and many others having registered interest with the Employees Provident Fund (EPF) the land-owner and master developer of the project the developers have yet to hear of more details or any formal time line being set. Some quarters reckoned that the project might be delayed due to the land conversion and other legal issues still being work in progress. In March, EPF chief executive officer Tan Sri Azlan Zainol said the pension fund was expected to start distributing portions of the 1,215 ha land, by June. A property consultant told StarBiz that if the June deadline for the land allocation was to have been met, more details and a tender date should have been revealed by now. Azlan had said EPF would start calling for tenders. At that time, he said each phase would be between 12.15 ha and 20.25 ha portions. EPF public relations manager Nik Effendi Nik Jaafar said it would make an announcement at an appropriate time. However, a senior state executive councillor for Selangor Investment, Industry and Trade said that he had not seen the Exco papers on this land conversion to date. “There is no reason to reject any application as long as the landowner follows all the rules and procedures of land applications. The Exco will normally approve it,” he said. 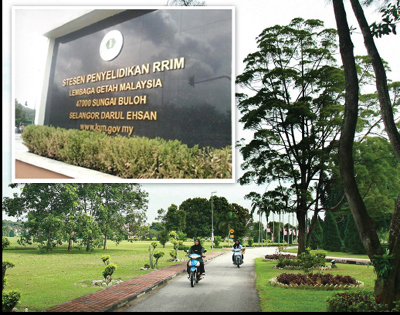 The RRI land would have to be converted from agriculture to another use. The development is likely to have a big linear park supported with other peripheral green lung dotting the entire project. Walkways, open spaces and water features are some of the likely aesthetics. Besides the residential and commercial aspects, the project would also be housing the My Rapid Transit (MRT) depot. The site of the depot, with a land area of about 180 acres, have already been cleared. While the residential and commercial development would unlock the value of the land, which currently is a wide expanse of rubber plantation, it is the new MRT line and its connectivity which would help to add considerable value to the residential and commericial projects in that area. According to sources, the bulk of affordable housing would be located in nearby the MRT line. Another issue for a possible delay in this project is that the master plan may have yet to be finalised. A source said the master plan for the 1,215 ha might be tweaked a bit. While it is normal for master plans to be tweaked several times before they are finalised, in the case for the RRI land, the status of that master plan is also unclear. It is learnt that EPF, through its subsidiary Kwasa Land Sdn Bhd, will enter into joint ventures with strong developers. Up until last week, Kwasa was still asking for developers to register their interest and to send in their company profile. Because of the size and value involved, and the gains to be had from it, a developer who succeeded in getting a parcel designated for residential use might not get a piece for commercial use, to ensure fair and just distribution, said a source. “There are plans for different nodes of it. The plan is to develop the place concurrently as much as possible with several developers working on their parcels respectively with land closer to the MRT to have affordable housing nearby,” the source said. Out of 1,215ha, Malaysian Rubber Board director-general Datuk Dr Salmiah Ahmad reiterated that 217 ha would be retained by the board. The MRT depot would occupy about 72ha. The commercial and residential portion, and its infrastructures and parks and open space would occupy the remaining land. The development is to be slated over the next 10 to 15 years. KUALA LUMPUR: IGB Corp Bhd has proposed to establish and list a real estate investment trust (IGB REIT) on the main market of Bursa Malaysia. KrisAssets, via its subsidiaries, proposes to dispose the properties to IGB REIT. In conjunction with the proposed REIT establishment and listing, IGB has also acquired a newly established subsidiary, IGB REIT Management Sdn Bhd, to act as the proposed management company for IGB REIT. CIMB Investment Bank Bhd, Credit Suisse (Singapore) Limited and Hong Leong Investment Bank Bhd (HLIB) have been appointed as the joint global co-ordinators and joint bookrunners for the proposed initial public offering and listing of IGB REIT. CIMB and HLIB have also been appointed as the joint principal advisers for the proposed REIT establishment and listing and the proposed disposal. CIMB and HLIB, have on behalf of IGB REIT Management, submitted an application to the Securities Commission (SC) for approval of the valuation of the subject properties in conjunction with the proposed REIT establishment and listing. CIMB and HLIB have also, on behalf of KrisAssets, submitted an application to Bursa Securities for its approval on the valuation of the said properties. A separate application for the proposed REIT Establishment and listing will be submitted to the SC within one month from the valuation application, as required under the SC’s guidelines on real estate investment trusts and the Capital Markets and Services Act, 2007. Nothing: Pathmanathan showing the area where his unit was supposed to have been built. For almost 12 years, 42 housebuyers have been paying monthly instalments of up to RM650 for houses that are only partially complete in Taman Koskan, Sungai Choh, Rawang. These housebuyers are fed up with excuses given by the developer and urging the state government to intervene to resolve the long-standing issue. StarMetro carried a report on this issue on Feb 23 last year, and judging by recent visit to the site, nothing much had been done. These housebuyers had even written letters to the Housing, Building Structure Administration and Squatters committee chairman Iskandar Abdul Samad, Hulu Selangor MP P. Kamalanathan, Hulu Selangor District Council and the Hulu Selangor Land office. So far, it has been futile. Retired government servant K. Pathmanathan, 62, said the issue had been going on for too long and it was time the state government came to the house buyers’ aid. “This was meant to be my retirement home. There is no structure built on my 5,400 sq ft of land. Where am I going to stay?’’ he asked. Another housebuyer, Nizam Nor said a group of housebuyers wanted another developer to take over the project. However, the Hulu Selangor Land office denied permission as the agreement was made between Ehsanibu Sdn Bhd and the Sungai Choh residents committee who comprised the housebuyers. “We want the state to terminate the developer’s contract and appoint a new developer. We are saddled with this problem as the previous state government wanted us to sign an agreement with the a state appointed developer to build our houses. “The developer has been giving us the run around and all our houses are only half-complete,’’ he said. Another housebuyer Jeyaseelan Anthony said the single-storey house project commenced in 2001 and the keys were supposed to have been handed over by 2003. “The developer said that work was still in progress,” he said. “Only for the last three years, we saw some progress with water pipes installed but there is no electricity,” said Jayaseelan. He added that the Hulu Selangor Land office had a meeting with the developer in 2009 and the developer promised that the project would be ready in six months. “At present we do not have proper roads, water supply and electricity,’’ he said. Jeyaseelan, 44, a teacher in Rawang, said he had been paying a monthly instalment of RM521. “Now, the developer wants us to pay a deposit of RM1,710 for electricty and water supply. 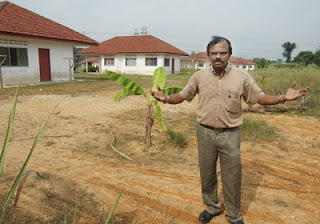 By right, the developer should compensate us since we have been servicing our loans for so long,’’ he added. Earlier, a spokesman for the developer said that about 30% of the housebuyers were not qualified to take loans and that complicated the situation. The housebuyers’ applications for land titles were rejected and this resulted in the project getting stalled. Selayang Municipal Council councillor Gunarajah R, George, who was present said that he had briefed State Health, Plantation Workers, Poverty and Caring Government committee chairman Dr A. Xavier Jeyakumar on this matter. 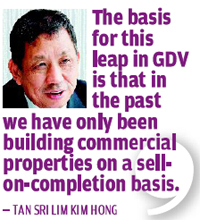 PETALING JAYA: OSK Property Holdings Bhd has turned to Groupon. In what seems to be an unprecedented marketing strategy by a property developer in Malaysia, the company, through the special-deal website, has put up an offer for potential buyers to get substantial discounts on down payments for its new development in Cyberjaya. “It's a clever move actually, to capitalise on the growing use of social media in Malaysia,” an industry observer said. The deal offered by OSK Property under Groupon is for a cash voucher of RM8,000 at RM500 to be used only on the down payment for the purchase of SOFO (small office flexible office) suites in Cyberjaya.